Two recent shows by Gob Squad confront us with illusion in a surprising way: while the collective of artists values the main principles of performance, especially risk and improvisation, it is often hard for the spectator to believe in the spontaneous and “authentic” dimension of the conversation in Gob Squad’s Kitchen and The Conversationalist. This reception issue undoubtedly results from our access to, or even our vision of reality, as well as our apprehension of any conversation. In this respect, these performances urge us not only to think about the principles of communication and authenticity beyond and, in a certain way, within mediality, but also to reflect on the significance of the real in our mind, for we are entities “in the medium” (Agamben). 1Performance arts have been largely directed against illusion. 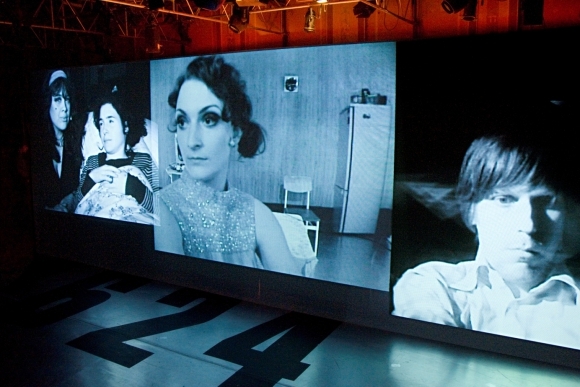 As suggested by the English expression Live Art, performance shows in the 1960s and 1970s strived to echo life rather than rely on the illusion of life and reality. They tried to convey authenticity and immediacy, as opposed to indirect art forms using props and machinery. In this sense, Live Art endeavoured to be “anti-theatrical.”1 These yearnings stemmed from the emergence of a new critical requirement, which consisted in unveiling the mechanisms of representation within the so-called reality, or in other words, in being aware of the development of our behaviors and thoughts, beyond “the daily staging of our self.”2 However, for the last fifteen years, these aspirations have questioned the former principles and ideals. As a consequence, it is often impossible to outright oppose narration and representation to performance and everything performative, since performances generally continue to highlight the symbolic systems, following the impetus of the Freudian and Lacanian theories, post-structuralism, pragmatic researches, etc. 4 Remarks made during an interview with Bastian Trost, 16 May 2014. 2The Gob Squad collective has also evolved since its inception in 1994.3 The complex shows it produces mix physical performances, visual and fine arts and abound with intellectual, scientific and literary references. However, they strive to stay true to the spirit of “the” performance, in particular to the notions of risk and improvisation.4 In this perspective, Gob Squad questions our relationship with illusion through two of its works conducted over the past few years. As a matter of fact, these shows plunge the audience into troubling illusions, although spectators are warned that these shows are essentially performances. Therefore, it is crucial to analyze this new relationship that they allow us to establish with illusion. Besides, this phenomenon confuses researchers for good reason. How to explain the appearance of such realistic illusions in a performance? One may wonder whether this is the result of the very nature of these illusions. Do specific thought processes make us more sensitive to illusion? Are these illusions dependent on a particular type of relation to the real? 5 David Foster Wallace, Infinite Jest, Boston, Little Brown, 1996. 3The Conversationalist is loosely based on a chapter of David Foster Wallace’s Infinite Jest, in which a man tries to give conversation classes to his tennis champion of a son, in order to cure his inability to speak.5 Four initial short sketches introduce extracts from the book. However, the spectator will have to cross the various tennis courts of a huge tennis club to attend the show: many performances share this in situ characteristic.6 Three of these sketches feature people (the “son”) on the tennis court, participating in group exercises, exhausting and absurd training, ball picking or monologues. The fourth sketch tells the son’s inner monologue as he faces father. His words are reproduced through a soundtrack, while Sharon Smith, playing the young man, dives into the swimming pool every time a sequence ends. Finally, the sketches show that this young taciturn man distrusts his father—an otherwise perfect illustration of the holder of symbolic authority (Barthes)—and does not feel the need to talk to him. Apart from the ball picking, which constitutes a feat in stamina, the scenes are obviously acted rather than performed. The link between them is fine a priori (it cannot be understood without referring to the relevant chapter of the novel), so that it falls to the spectator to develop thoughts. The show will also make us think about the advantages of possessing conversational skills. 4Around 6pm, spectators are asked to join the central tennis court, where the main part of the show is to be played. 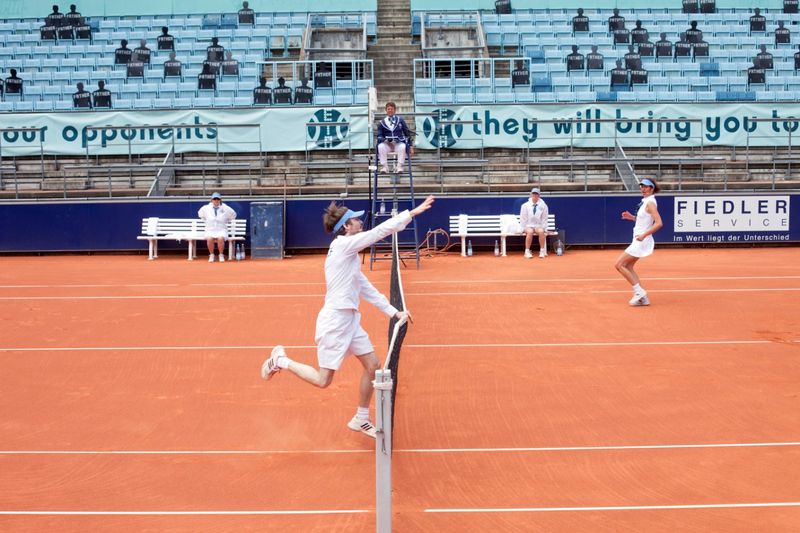 Five people in outmoded tennis outfits present the rules of the match: the game will be played in three sets. The referee will launch the game by giving a topic of conversation. He will then judge the relevance of the players’ replies, players who have no racket or ball, yet are allowed to use body language (their choreographies will very loosely draw on tennis moves). In all honesty, it is sometimes difficult to assess the replies. However, the referee presents his arguments whenever he interrupts the game: either a player is too subjective, too talkative, clearly off topic, or indulges in sophisms. The utter lack of contextualization could make these exchanges a bit arbitrary, but the variety of themes which range from “you and me” to “the role of still life in 19th century painting,” the use of impressive general knowledge, the integration of autobiographical elements, the acrobatic virtuosity of certain moves, or the equally skilled articulacy that gives rhythm to the exchanges, greatly entertain the audience, judging by the enthusiastic round of applause that concludes the show. 5At the end of the game, a great number of spectators were convinced that the “conversations” had been elaborated.7 They were indeed clearly based on improvisations, as is the case of numerous contemporary collective works. However, this collective writing and the game pertain to illusion, since the performers were neither given the themes, nor the necessary references to treat them. This illusion is all the more incomprehensible that the referee’s introductory explanations mentioned that there would be “unexpected themes” and that the debates should be “lively.” How can we explain that the illusion was so complete? As it happens, the illusion is paradoxical since it is an illusion of theatrical construction and parts: an illusion of illusion. 8 In reference to Georges Roditi’s work L’Esprit de perfection, Paris, Stock, 1984. 6Several hypotheses come to mind. On the one hand, the quality of these verbal jousts and crazy antics seem to result from a “spirit of perfectionism.”8 On the other hand, the context does in no way presuppose the quality of the improvised dimension of the show, since the introductory sketches partake in the game. From this perspective, the game seems to be in line with the sketches. Besides, certain sequences are planned: spectators occupy the stands only on one side of the rectangular court; in front of and beside them are empty rows, partly occupied by the cardboard “ghosts.” At the end of the first set, an actor (?) climbs the stands and shouts at his dead father, pretending to see him in the side rows in front of him. Of course, this is staged. This kind of situation is typical of Gob Squad’s plans. The collective often relies on situations and sorts of canvases of roles, distributed to different actors from one performance to the other. The game is often very dynamic! 10 Again, we are referring to the interview with performers that followed the show. 8These explanations seem a bit simplistic however, since many festival-goers are theater regulars and are therefore used to all its forms. The spectators’ mistake may be partly linked to the “spirit of perfectionism” in a much more fundamental way. Nowadays, when one engages in an skill-demanding activity, one makes sure to show it and seek recognition: just take a look at all the “records” programmes and the “performance society.” In this case, we are dealing with first-rate conversations, implying a coordination effort, but also genuine intellectual skills, often resulting in witty comments coupled with meta-reflexive considerations, if not meta-conversational. Maybe the idea of such work is just unknown to a lot of people, all the more so that this work is not shown off. Incidentally, the performers insist on the hard work that is necessary to pull out relatively crazy antics while elaborating appropriate unique comments, in the sense that they are never repeated, and do not give the impression that they “fill” the “gaps”10 too much. 9This deeply intellectual and artistic work comprises another source of uncanniness. The very notion of conversation may indeed be problematic, as the conversation-battle takes on exaggerated traits, which somehow parody the over-regulated—and strategic—conversations held in the French royal court. However, the arbitrations present rather general grounds, close to the principles required for good communication as established by Grice: maxims of cooperation, relevance, quantity, style, etc.11 To answer his/her partner, the performer has to draw on his/her experience, readings, memory. Consequently, personal commitment is quite strong. The exchange has nothing to do with platitudes or ready-made phrases. In fact, these exchanges are closer to what phenomenologist Waldenfels defines as a real conversation12: rewarding and rare because it makes us look beyond our preconceived ideas and consequently, to surpass ourselves. This responsiveness has us evolve in a space that does not yet belong to us, but comes from us. As a result we share a gift with others, a gift over which we have no control. 10In a way, the inability to see an operating intellectual preparatory effort or genuine conversation amounts to giving little credit to this work or to an elaborate conversation, and may even amount to failing to realize the personal involvement necessary to confront the other and an intellectual requirement. If one does not feel like bringing oneself into play in the context of an exchange, how can one come up with the idea of this involvement? 11This demonstrates that all spectators only perceive reality within the limits of what they can experience. Their awareness of the illusion may also determine their awareness of the limits of their “vision of reality.” In this sense, Gob Squad’s second show allows the spectator to become aware of his/her illusions and delve further into the study of the links between the vision of reality and illusion. 12This show entitled Gob Squad’s Kitchen seems to take us far away from the Court to mundane activities. However, Gob Squad operates in three phases. The spectator is first invited to walk on stage, in sorts of cells roughly separated by thin walls; he/she sees a “sleeping” woman, before he/she is welcomed in a tiny kitchen where real elements are mixed with objects in trompe-l’œil. Eventually, the spectator enters an unclassifiable room containing computers and a big mixing table. Is this an apartment or a recording studio? Is it both? 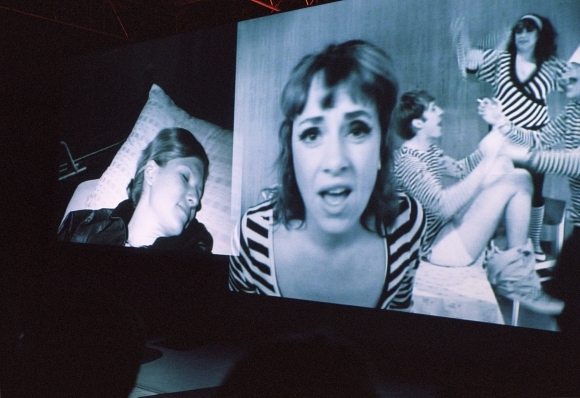 One is perplexed until the curtain rises, revealing a gigantic screen displaying three juxtaposed films: a video of the “sleeping” woman, one of the kitchen and one of a person who just stares at the camera. The performers’ positions mimic the positions and actions one would find in Warhol’s movies, as well as the striped t-shirts that actors used to wear at that time. The most noticeable change lies in the fact that the actors directly address the camera. 13 These films were shot between 1964 and 1966. 13It is explained that this experiment is based on a series of films created by Andy Warhol in the 1960s: Kitchen, Sleep, Kiss, Eat, Drink, as well as a series of screen tests.13 In this way, Warhol wanted to account for the everyday life, without passing dramatic or heroic (hence “false”) events, instead focusing on the genuine and experienced reality. The performers tell us that they want to go back over the 1960s experiment and show individuals in their kitchen, sleeping, kissing or simply staring at the camera. Of course, recreating the experiment in a theatre means that it is impossible to reach the same degree of authenticity. Warhol’s shootings aimed for “spontaneity,” but contrary to Gob Squad’s works, they did not feature live screening. The conspicuous desire for authenticity is in fact related to the questioning of Warhol’s principles. In this regard, the quotes from an article published at that time and emphasizing the revolutionary nature of films are anything but natural.14 The efforts made in order to copy the gestures and words from that era are utterly ridiculous, just like the comments that come with them. Together with this meta-theatrical dimension, we are confronted with a “sudden burst of reality”: after some time, Sean Pattern, reduced to staring at the camera, rises up and tells Sharon to take his place. Sarah Thom tells that she has had enough of pretending to be asleep and looks for a substitute… in the audience. This event marks the beginning of the third phase of the show: in turns, the performers who are bored with their part will pick up a spectator to replace them in front of the camera. This step somehow represents the culmination of the desire to show the ordinary person. However, briefing spectators and equipping them with a headset (designed to give them instructions) seems to put an end to the desire for authenticity.15 In this way, the spectator and substitute for Sean does not simply stare at the camera, but also pulls out various funny faces. His answers to the questions he is asked also turn the 1960s into derision. The picture shows the three screens put before the spectators’ eyes. However, the spectator is unable to check what is going on behind these screens. From left to right: the parody of Sleep, the parody of Kitchen and the parody of portraits. Sarah Thom is explaining to the participating spectator how she is to replace her. 14Of course, such caricature plays with our habits as spectators and disillusioned Internet users accustomed to seeing images of everyone. On top of that, the latter images are integrated into deceitfully spontaneous scenarios, in which improvisation is often limited, if not prevented. While in The Conversationalist, one could venture the hypothesis that such attitude towards the media would influence our perception of reality and cause our distrust of any form of spontaneity, this very attitude is here mise en abyme. 17Gob Squad simultaneously works on two levels. On the one hand, like many contemporary performers, the members of the group learn a lesson from the impossible immediacy and authenticity: by making fun of what claims to be authentic and immediate, but also by showing the ideological and perceptional gap that separates us from the 1960s. In this respect, the experiment falls within what André Eiermann calls “post-spectacular theatre”: “a theatre form that takes account of the fact that the immediate encounter with the other [and authenticity] are impossible, since a third mediatory entity is always involved in any relation to the other. This entity is defined by Jacques Lacan as the symbolic order or the ‘great Other.’ Contemporary performance goes against the ignorance of this triangular structure, insofar as it makes one experience this structure through the introduction of the ‘great Other.’”17 In other words, the “great Other” here refers to the ideals and prejudices of the 1960s, with which it is difficult to agree without irony. On the other hand, instead of limiting themselves to this kind of unilateral conclusion, the Gob Squad members play on the notions of immediacy, authenticity, risky and honest research, despite everything, by putting themselves into play hic et nunc… In this sense, the collective goes beyond the post-spectacular theatre and questions its way to thwart illusions. The issue is the following: by setting oneself up as the judge of others’ illusions, doesn’t one take the risk of becoming blind to one’s own illusions? 19Of course, the illusion of an illusion is indicative: while numerous contemporary performances strive to frustrate our expectations and interpretations in order to raise our awareness of them, here the expectation or “great Other”—to quote Lacan and Eiermann—is our expectation of illusion. Guy Debord’s society of the spectacle would then have developed to the extent that nothing but the spectacle would exist? 20The way post-spectacular theatre is presented to the spectator, before contradicting this first impression, certainly makes him/her ponder. All in all, the critical researcher will not be the only one to wonder about the reasons for illusion, since the spectator will do too. 21The first moments of the performance put the spectator on false leads: here the lead of disillusionment concerning authenticity in the almost condemning first part of the performance. The irony of the situation certainly makes one think that, through the spectators-actors, fun is still made of these useless quests for authenticity, be it the individual-performer’s authenticity or that of the meeting with the spectator. 22Besides, it is quite liberating to agree with the idea of the represented: our judgment is freer, less censored, our reactions globally less inhibited.18 Sometimes, there is a playful dimension to it (arguably, “nothing can be completely taken seriously”19). It also helps solve the issue of the spectator’s positioning throughout the show. In fact, when spectators climb on stage, we are shown “a live device that integrates ‘real’ people into scripted scenarios, using both presence and representation as sources of authenticity.”20 Suffice to say that the particularly complex combination of traditionally distinct modes (the authenticity, the people known as “real” and the presence are essentially related to performance, as opposed to the scenarios and shows, which rather pertain to “theatre”) is enough to confuse the spectator21… Furthermore, it is easier for the spectator to judge the spectator-actor without constantly identifying with him/her: if the latter is playing, at most one can wonder whether one would have acted as well as him/her. When the latter does not act, the spectator wonders how he/she would have responded in the position of the spectator-actor, the situation is therefore more uncomfortable. Yet, the situation is already uncomfortable, due to the fact that the actors step aside, because it is the actors who “are aware of the meaning they convey.”22 Their disappearance results in the erasure of the conveyors of meaning, the spectators-actors play it by ear and no one seems able to tell “where all of this is going.” Confronted with the broadening of meaning, which is likely to fuel the feeling of the absurd,23 it is no surprise to see some spectators protecting themselves and developing the unique and coherent idea of denouncing the former avant-gardes. 23While the show impedes our expectations and raises our awareness of them, these expectations also refer to greater presuppositions. Doesn’t our “desire for illusion” also involve the relation to ourselves, to our view of interactions with others and to performance-theatre? 24The spectator’s conviction that he/she is watching spectators-actors act may be the result of his/her being accustomed to seeing others “play.” Not only do we all play our social roles (Erving Goffman’s theories are now well-known in this regard), but we also frequently do so or see others do so via webcams, videos or cell phones. We could even go further and affirm that mediations and re-mediations have gotten us used to the fact that “some aspects […] of the other [which present the Other’s reality, according to Lacan] are imperceptible and evade us.”24 It just so happens that this awareness affects our behavior with others: since “our encounter with the Other never consists in immediately encountering the Other’s real aspects […] we only encounter a representation of the Other based on our relation to the symbolic order.”25 Then, we can even go a bit further: we may take for granted that what is represented is essential, is somehow “what we make of it.” Isn’t “reality” generally related to the imaginary dimension, according to Lacan?26 Numerous philosophers have failed to define reality, most of them precisely struggling with the subjective aspect of the notion of reality (perceived reality, recognized as such). The hypertrophic vision of illusion is not necessarily attributable to a particularly developed monadology of the present era. Just think about the philosophies that have been accused of solipsism, such as Leibniz’s, Fichte’s, or even phenomenology. 25In this case, performance helps us to answer the question that Bressan has left open: “Does the reality phenomenon precede adherence or is it the adherence to a set of physical and mental contingencies that gives rise to the ‘reality phenomenon’, whatever it may be?”27 There is no question that the “reality phenomenon” here, in other words “the play that we mistake for reality,” stems from the spectator’s imagination. 26However, one tends to detach oneself from reality when perceiving only play (and not reality) or when thinking that we can only see the other as a “representation.” The awareness of this form of detachment can only be salutary: we never listen to and above all never trust the other enough. The occasionally witty answers of the spectators-actors to questions about names, our future or love stories, demonstrate cheering invention skills. The ability to make light of and (re)formulate things in one’s own terms represents an essential subversive ability for Judith Butler,28 the ability to influence the course of speech and the world. 27Moreover, these answers suggest an ability to share and communicate in a much deeper way than we would assume in the era of standardized interactions, which do not require any personal involvement per se. This ability also shows how, through narration, people seek to give meaning to their life and through striving for detachment, notably by resorting to humor, to address others and question their ways to give meaning. As for the kitchen activities at the end, as insignificant as they may be, they show an ability to collaborate, get closer to one another, take action and coexist.29 They may even result from the desire to share more frequently and spontaneously… The spectators’ performance also demonstrates that the human being is fundamentally a living being “in play,” in other words a being moulded by interaction, a being that endlessly discovers itself. 29It is certainly in virtue of all the questions it raises that this show was awarded the Drama Desk Award in 2012, as “the best theatrical experience.” The spectator, who was supposed to make fun of 1960s illusions, could appreciate the reality of illusions in a much more radical way than he/she may have wished to. This sheds light and enlightens us on our relation to illusion. The first illusion to overcome is the illusion of being an informed spectator who will not let him/herself be influenced by his/her habits and who knows the characteristics of performance as well as its wavering between reality and play.32 We are now tending to develop excesses that are opposed to those of the 1960s: distrust of any immediacy, at times protective, at times convenient and inclining us to a certain intellectual laziness. We do not trust the creative, spontaneous and subversive nature of humans enough. 30As for the artists from the 1960s, we may also be led to put derision into perspective: eventually, these quests for aesthetic authenticity and democracy represented a liberation from the norms of the era, which artists like Warhol did not think they had already achieved through such films. Performance also enables us to see that the limits of authenticity are revealed through the evolutions of society, and especially its media impregnation. At the same time, performance is a call for the real, for everyone’s involvement in the real so as to reinvent it, each in their own way. Brémaud Nicolas, “Introduction au concept de réalité chez Lacan,” Évolution psychiatrique, July 2013, vol. 78, p. 538-548. Bressan Yannick, Le Théâtral comme lieu d’expérience des neurosciences cognitives: à la recherche du principe d’adhésion, Paris, L’Harmattan, 2013. Eiermann André, “Le nuage n’était pas là ! Moments poétiques au sein du théâtre-performance contemporain,” in Beaufils Éliane (ed. ), Quand la scène fait appel, Paris, L’Harmattan, 2014, p. 79–96. Fischer-Lichte Erika, The Transformative Power of Performance: A New Aesthetics, London, Routledge, 2008. Grice Paul, Logic and Conversation, in Cole Peteret and Morgan Jerry (ed. ), Speech acts, New York, Academic Press, 1975, p. 41-58. Roditi Georges, L’Esprit de perfection, Paris, Stock, 1984. Shalson Lara, “On the endurance of theatre in Live Art,” in Johnson Dominic (ed. ), Critical live art: contemporary histories of performance in the UK, London, Routledge, 2013, p. 154-168. Waldenfels Bernhard, “Réponse à l’autre. Eléments d’une phénoménologie responsive,” in Waldenfels Bernhard and Escoubas Éliane (ed. ), Phénoménologie française et phénoménologie allemande, Paris, L’Harmattan, 2000, p. 357-374. 1 See Lara Shalson, “On the endurance of theatre in Live Art”, in Johnson, Dominic (ed. ), Critical live art: contemporary histories of performance in the UK, London, Routledge, 2013, p. 154-168, here p. 154-155. 2 In the 1950s, Goffman’s studies emphasized the theatrical part of our daily interactions, thus inspiring numerous artists and thinkers, including creator of Performance Studies Richard Schechner. See Erving Goffman, La Mise en scène de la vie quotidienne (The Presentation of Self in Everyday Life). La Présentation de soi, Paris, Minuit, t. 1, 1973. 3 Let us note that the internationally renowned collective, winner of awards in Europe and in the USA, was established by students from universities of Nottingham and Gieβen, who are still key members of the group. 6 We are referring to the show as performed in Mannheim, Germany, during the Theater der Welt international festival, May-June 2014. A first version of The Conversationalist was developed in 2012 in Berlin, for the HAU, during a 24h marathon presenting Wallace’s masterpiece in various places in the city. 7 This is what the exchanges with the audience after the 31 May 2014 Mannheim show clearly brought out. 9 Let us mention the French researches on mediology and those of Paul Virilio, international journals such as Media, Culture and Society, numerous studies such as the collective article “Assessing Latent Level Associations Between PTSD and Dissociative Factors: Is Depersonalization and Derealization Related to PTSD Factors More So than Alternative Dissociative Factors?”, Psychological Injury & Law, June 2014, vol. 7, issue 2, p. 131-142. 11 See Paul Grice, Logic and Conversation, in Peter Cole and Jerry Morgan (ed. ), Speech acts, New York, Academic Press, 1975, p. 41-58. 12 For example, see Bernhard Waldenfels, “Réponse à l’autre. Éléments d’une phénoménologie responsive,” in Bernhard Waldenfels and Éliane Escoubas (ed. ), Phénoménologie française et phénoménologie allemande, Paris, L’Harmattan, 2000, p. 357-374. 14 We are referring to an article written by Norman Mailer, who considered the film as showing an “appalling banality,” reflecting only too well the spirit of that era and allowing spectators to understand what led to a new era. Simon Will only refers to the most laudatory sentences, emphasizing the revolutionary aspect of this work. See [online] http://www.warholstars.org/filmch/warhol/kitchen.html [accessed 22 July 2015]. 15 Also confirmed by Bertie Ferdman: “the audience actors, so firmly set up by the GS-members who instruct them via headset […] everything seems perfectly planned.” See Bertie Ferdman, “Reverberating acts”, PAJ, no. 99, vol. 33, September 2011, p. 72-81, here p. 76. 16 We are here referring to the show in Mousonturm, Frankfurt, 13/09/2013, and the video recorded in 2009 in Nottingham. See also Bertie Ferdman, “Reverberating acts,” PAJ, no. 99, vol. 33, September 2011, p. 72-81, here p. 76. 17 André Eiermann, “Le nuage n’était pas là ! Moments poétiques au sein du théâtre-performance contemporain”, in Éliane Beaufils (ed. ), Quand la scène fait appel, Paris, L’Harmattan, 2014, p. 79-96, here p. 83. 18 Bressan draws a parallel between the removal of inhibitions in dreams and in play: everything is possible, including for the observer. In the field of phenomenology, this is referred to as “putting reality in an aside.” See Yannick Bressan, Le Théâtral comme lieu d’expérience des neurosciences cognitives: à la recherche du principe d’adhésion, Paris, L’Harmattan, 2013, p. 128. One can also refer to the work mentioned on this subject, William James, The Will to Believe, and Other Essays in Popular Philosophy , New York, Dover Publications, 1956. 19 Which may be interpreted as hinting at the quite cynical postmodern “anything goes,” or as a non-idealistic vision of the post-sovereign subject as described by Judith Butler, i.e. aware of the fact that he/she always has to come to terms with preceding roles and words. 20 See Bertie Ferdman, “Reverberating acts,” PAJ, no. 99, vol. 33, September 2011, p. 72-81, here p. 76. 21 Bertie Ferdman, “Reverberating acts,” PAJ, no. 99, vol. 33, September 2011, p. 72-81, here p. 76. 22 Stéphane Braunschweig, in Yannick Bressan, Le Théâtral comme lieu d’expérience des neurosciences cognitives: à la recherche du principe d’adhésion, Paris, L’Harmattan, 2013, p. 98. 23 As demonstrated by American commentator Andy Propst, Back Stage, 26 January 2012, vol. 53, p. 12-13. 24 André Eiermann, “Le nuage n’était pas là ! Moments poétiques au sein du théâtre-performance contemporain,” in Éliane Beaufils (ed. ), Quand la scène fait appel, Paris, L’Harmattan, 2014, p. 79-96, here p. 87. 25 André Eiermann, “Le nuage n’était pas là ! Moments poétiques au sein du théâtre-performance contemporain,” in Éliane Beaufils (ed. ), Quand la scène fait appel, Paris, L’Harmattan, 2014, p. 79-96, here p. 87. 26 See Nicolas Brémaud, “Introduction au concept de réalité chez Lacan”, Évolution psychiatrique, July 2013, n° 78, p. 538-548. 27 Yannick Bressan, Le Théâtral comme lieu d’expérience des neurosciences cognitives: à la recherche du principe d’adhésion, Paris, L’Harmattan, 2013, p. 14. 28 Dealing with women’s issues, the philosopher shows the extent to which we build our identity through our use of words. Much more than Foucault, whose works constitute her work basis, she emphasizes how much the subversive use of words help us to develop power and to establish ourselves as free subjects. Among other readings, see Judith Butler, Gender Trouble: Feminism and the Subversion of Identity, New York, London, Routledge, 1990, and The Psychic Life of Power: Theories in Subjection, Stanford, Stanford University Press, 1997. Philipp Schulte’s thesis refers to Butler’s works to analyze performances: Identität als Experiment. Ich-Performanzen auf der Gegenwartsbühne, Frankfurt, Peter Lang, 2011. See also the author’s article (in French): Éliane Beaufils, “Before your very eyes and Rhythm Conference Feat. Inner Splits : réflexions performatives sur l’identité performative,” in Flore Garcin Marrou, (ed. ), Théâtre, performance, philosophie, Paris, to be published in 2015. 29 Reminder: according to Nancy, the modalities of “coexistence,” of which there is a lack, are structuring for our perception of the community… See Jean-Luc Nancy, La Communauté affrontée, Paris, Galilée, 2001. 30 See Erika Fischer-Lichte, The Transformative Power of Performance: A New Aesthetics, Londres, Routledge, 2008, p. 46. 31 Once again, we are referring to Waldenfels, but also to Lorraine Code’s well-known idea of “second-personhood”, introduced in her work What can she know? Feminist Theory and the construction of Knowledge, New York, Cornell University Press, 1991. Éliane Beaufils is a lecturer in theater and performance studies at Paris 8 University. A graduate of German Studies and the Institut d’études politiques of Paris, she has taught at the ENSAM (mechanical and industrial engineering school) and universities of Hamburg, Strasburg, Frankfurt and Paris 4-Sorbonne. She is the author of Violences sur les scènes allemandes (Paris, Presses de Paris Sorbonne, 2010), Quand la scène fait appel… (Paris, L’Harmattan, 2014), as well as around thirty articles, both in French and German, published in reviews and collective works. Her researches focus on contemporary theater plays and performances, the performativity of bodies and voices, the reception of violence and pain, as well as poetic thinking, in particular in German- and Flemish-speaking theater.